The College of Science and Mathematics (CoSM) provides a unique blend of disciplines from human factors to neuroscience, polymer chemistry to biochemistry, sensor development to sensory perception, and computational modeling of ecosystems to water percolation in soils. With a long tradition of helping first-generation and underrepresented students earn their college degrees, the College of Science and Mathematics is committed to the success of our students by providing hands-on research opportunities and real-world experience. Currently CoSM offers eight undergraduate programs (including 9 majors and 8 minors), 15 masters programs, and 4 Ph.D. programs. There are approximately 165 faculty within the college. In the Fall of 2014, there were 1866 registered students in the college (1442 undergraduates). The largest departments in the college in the Fall of 2014 were Biological Sciences and Psychology. Academic advisors in the CoSM help students transition to the college by providing program of study information, guiding students to create a connection with their departments and faculty, as well as providing student success programming. Advisors offer one-on-one tailored services for diverse student populations and can assist in answering your questions about the Wright State Core requirements (general education), along with university and college requirements. CoSM reaches every student at Wright State University with one or more of its classes whether or not they are a science or mathematics major through core education requirements. 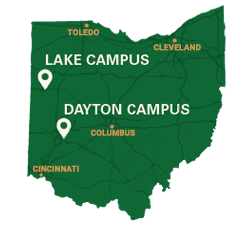 The Wright State University College of Science and Mathematics (CoSM) was founded in 1964 as one of the first two colleges of the new Dayton Campus of Miami University and Ohio State University. In 1964, CoSM was known as the College of Science and Engineering. In 1985, Wright State University established the College of Engineering and Computer Science and the College of Science and Mathematics. CoSM remains one of the largest colleges on campus.